Home › SEO › Is There a Google Algorithm Update in January 2016? Is There a Google Algorithm Update in January 2016? If you want to improve your search presence with better SEO reach out to us at jesse@wojdylosocialmedia.com. We have several monthly packages that can help you rank better in the local maps and organic search. Notice that Hope Valley Commons has zero reviews and doesn’t even have a website. 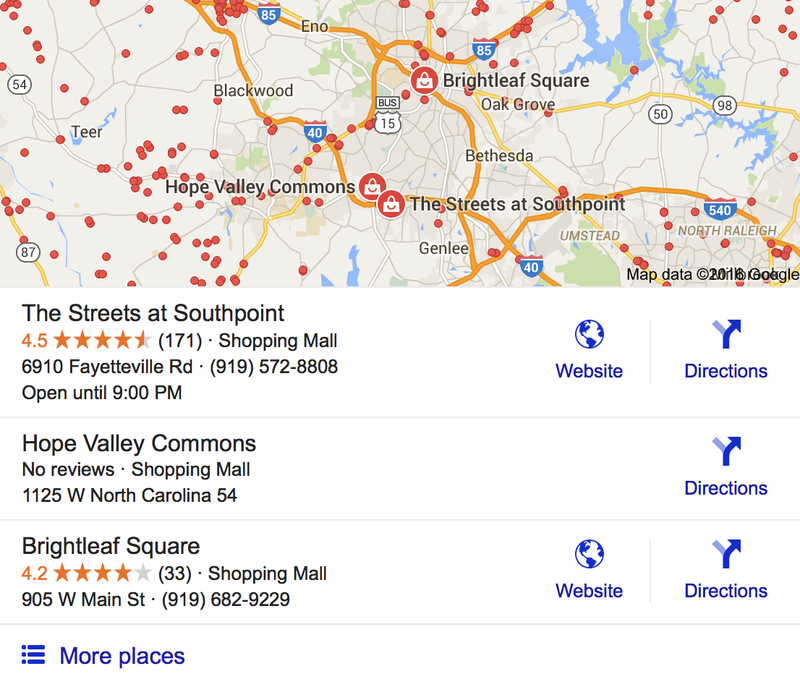 From personal experience, Hope Valley Commons is a terrible result when searching for “Durham Shopping”. This is proof that the local 3 pack search results are quite obscure in early 2016 as a number of queries are providing poor results. The local pack poor results have filtered into the organic results as well. When searching for a specific mortgage broker in North Carolina five of the 10 front page results were for Yelp.com. Three of the other five were listing or review websites. This means only two out of the 10 results were actual mortgage brokers. As a mortgage broker, this can be very frustrating as you are losing the opportunity to get new clients from search traffic. Some would argue that you could increase your Yelp presence but from personal experience we can tell you that Yelp is going to end up charging for optimal locations on the Yelp page. Businesses have the option to pay for Yelp ads or Google ads. In our opinion, this is very bad for the search experience. We firmly believe that the search results will change in the very near future as users do not want to only see review websites when looking for a service. 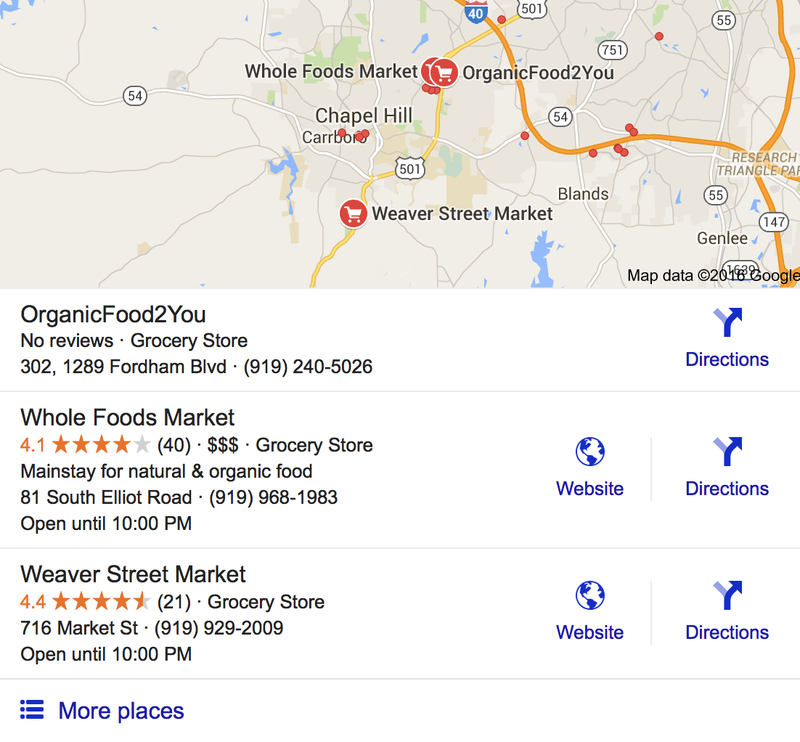 On the Google Local front, it looks as if Google Pigeon has been completely axed. Why did Google assign value to organic listings in July 2014 only to take it away in January 2016? Our professional opinion is that Google will eventually settle on organic search results greatly influencing the local maps results. How many local map results show up on the front page is another questions altogether. In January 2016, there are three but that can change to seven or 10 very quickly. Some have asked if Facebook has a correlation to the new local search results. In our opinion, this is not the case. In the result below OrganicFood2You has a Facebook page that has not been updated since October 2012 and there are very few likes and/or reviews. If you are struggling to understand any type of Penguin, Panda or Pigeon algorithm update feel free to reach out to us at jesse@wojdylosocialmedia.com. We have a team of SEO copywriters, graphic designers and technical specialists that can help you improve your search presence today. Allow us to help you get more business from your website. If you are a personal injury lawyer, mortgage broker, orthodontist or business professional that will benefit from more search results a strong web presence can help you take your business to the next level. Having worked in the most competitive industries in the United States we are confident we can take your business to the next level with a very strong website and overall web presence. Snapchat White Ghosts on Friends List in January 2016 | Has There Been an Update to Google Local Map Rankings?